I see you have the right equipment for putting drywall up on the ceiling! So have you moved all your utilities/re routed drains already? Are you keeping those cabinets along the window wall? Will they interfere with the aisle and ramp? 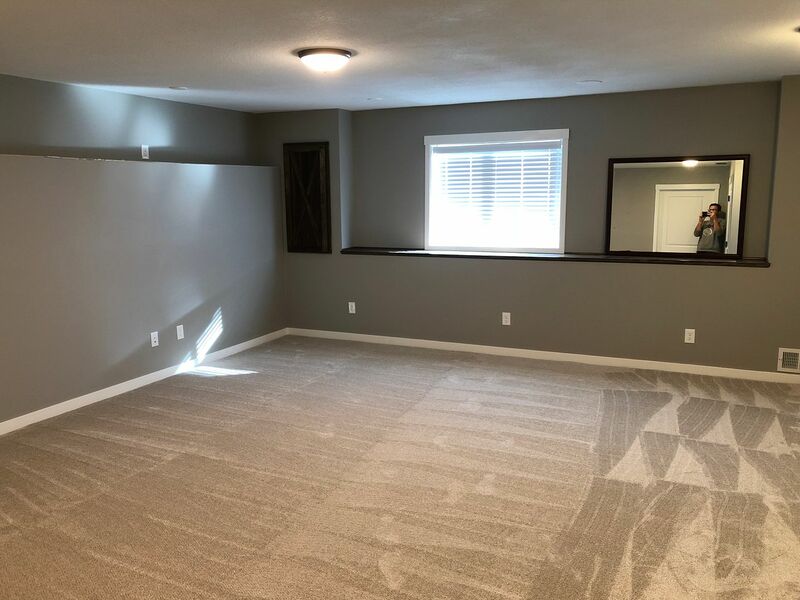 the lack of posting is not a reflection of the lack of progress on my layout room, in contrast I have been working really hard on the room and on a new layout plan. 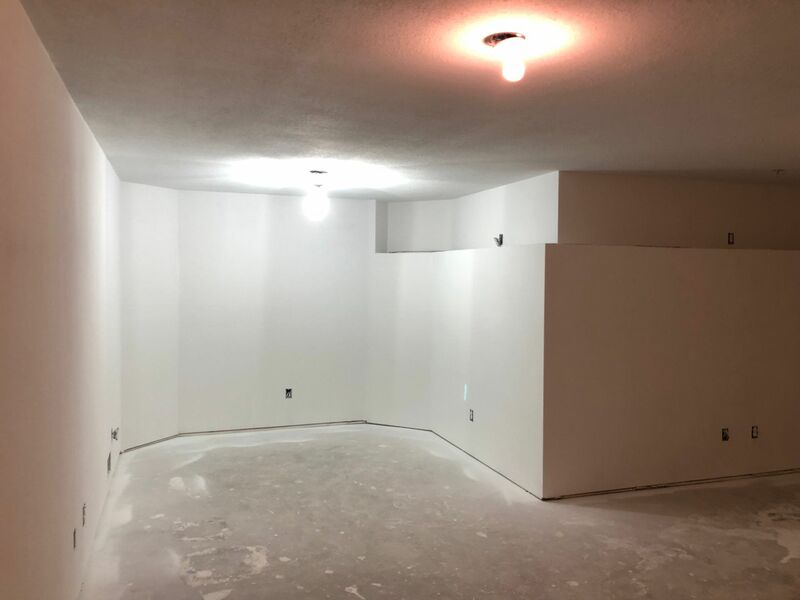 these are the latest photos of the room, however I am farther than the photos show, all doors and all finished carpentry is done and the walls should be ready for paint next week, then it is carpet and light fixtures and it is all done. 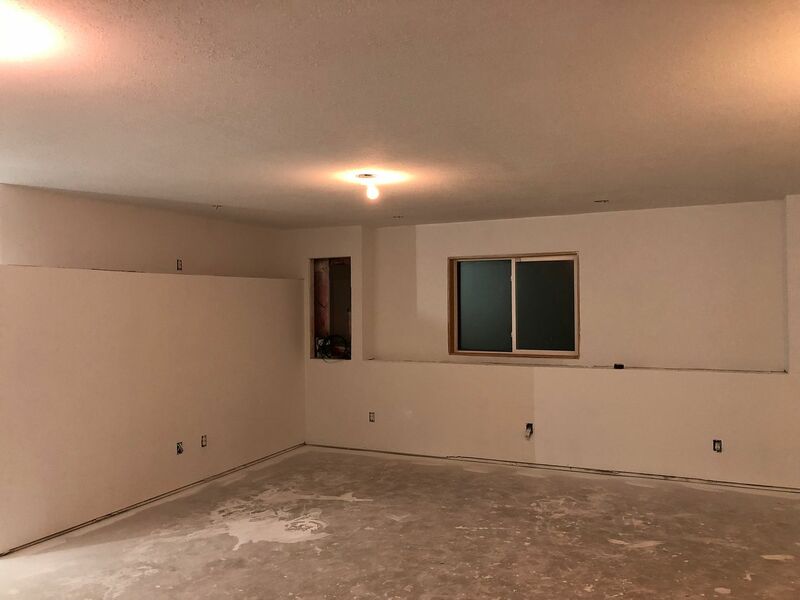 when I was putting up the walls I am glad I had the insight to not eliminate that weird shelf in the wall that is 6' off the floor because I now have a plan that can make use of that as you will see in the following post. after much thought, and throwing ideas back and fourth with Brian Bond and Mark Chase I decided to change my plan. I decided to look at my goals and try to really focus on what I really wanted and got get off track. I also wanted to simplify construction as well. the old plan had three lift outs sections that would need to be used during operations. I really wanted to remove those lift outs from the plan. Also, when designing the benchwork for the layout it just got really complicated to make some sections work out due to some very low clearances between levels. after talking with Brian we decided that there was just too much track for a narrow gauge railroad. most narrow gauges used as little tracks as possible and they seldom had the luxury of run arounds everywhere. the new plan eliminated all the run arounds at the mines, and now the operators will have to plan the moves they will need to make before they reach the mines. and speaking of mines, on a narrow gauge the coal is almost always run-of-mine coal, so the tipples are very simple affairs with very simple track arrangements. therefor, to make the switching interesting I have to make sure I have lots of simple mines instead of a few big mines. having a few facing moves will really be the only variety in the switching. another change was to create branch lines that are as isolated as possible. normally on a narrow gauge the coal mines are not all right along the main line, they are normally on a branch line the follows a waterway up a "holler". On a model railroad that is build on a narrow shelf it is hard to create the feeling of pealing off the main and going up an isolated spur to reach a coal mine. the new plan has a mainline that goes from the dump trestle to a large coal truck to rail transloader, much like the Manns Creek did, and two isolated coal branches to reach a few small and large mines. One branchline is only isolated from the main line but is not isolated from the main train room. the second branch is in a space all its own and the operator is completely isolated from the main room thanks to using a mushroom layout design. the branchlines are shown in blue and orange on the track plan. both branchlines leave the main at a run around / passing siding. operators will have to position car spots at the run arounds and shove up the branchlines. then trains will return the main and rebuild trains so the locomotive is on the front for the return trip. the plan may look complicated to build but the increased clearances between decks will allow me to use a conventional double level layout construction methods. the mushroom will be high enough that most people will be able to enter just by walking under the layout without ducking. to enter the mushroom an operator will walk under the curve at the breaker box and climb the three steps up to the mushroom platform. that weird 6' ledge in the wall will provide space for the mushroom branch to be built along the wall. trains will use a three turn helix to reach the second deck. at the exit of the helix is the junction of the orange (mushroom) branch and a passing siding. trains bound for the orange branch will be backed up the branch until off the mainline and then stopped. 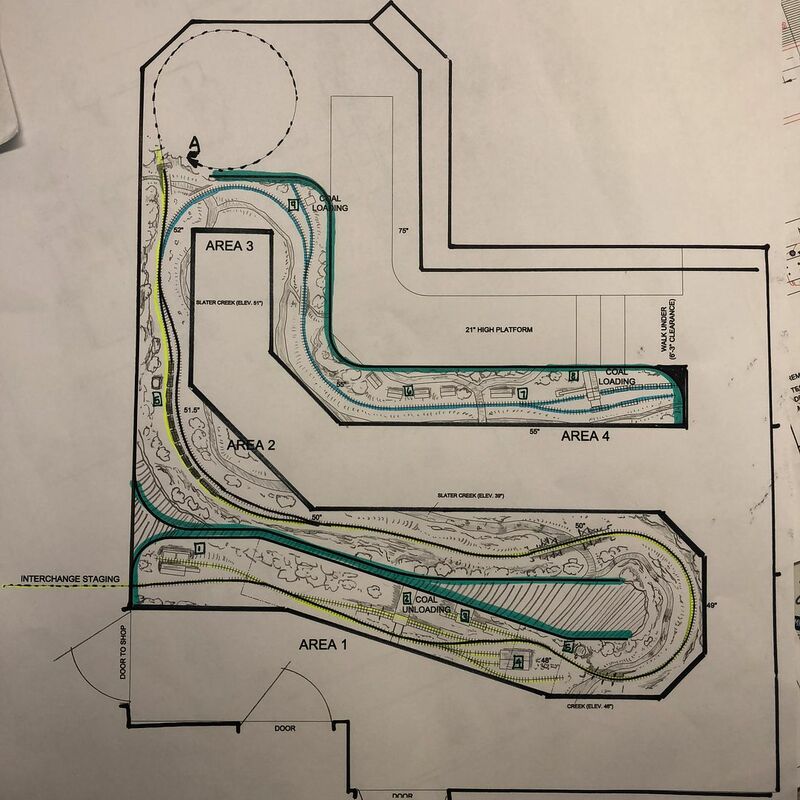 the operator will then walk around, enter the mushroom and walk down the aisle toward the helix at which point they can look across and see their train again, and then continue from that point up to work the branch. I did include a branch off the upper level that will go through the wall to a staging track to represent a sawmill. at some point that could be extended into the next room and I could build a mill, but for now I will just stage a lumber train. the lumber branch will pass under a hill that will be used to support the coal truck to rail transloader (strip tipple). I don't like the helix but it did solve a problem I was having trying to reach the second deck without using all my layout space just to reach the second deck. running geared locomotives in a helix is not ideal but it is workable. there is a teal blue line that represents the backdrops incase it is hard to make out where they will be. for those that do not know what a mushroom is, on a mushroom the lower level faces the opposite direction of the upper level in the same area, which makes it so the viewer / operator only sees one level. the raised platform of the mushroom makes the second level feel like a normal single level layout. 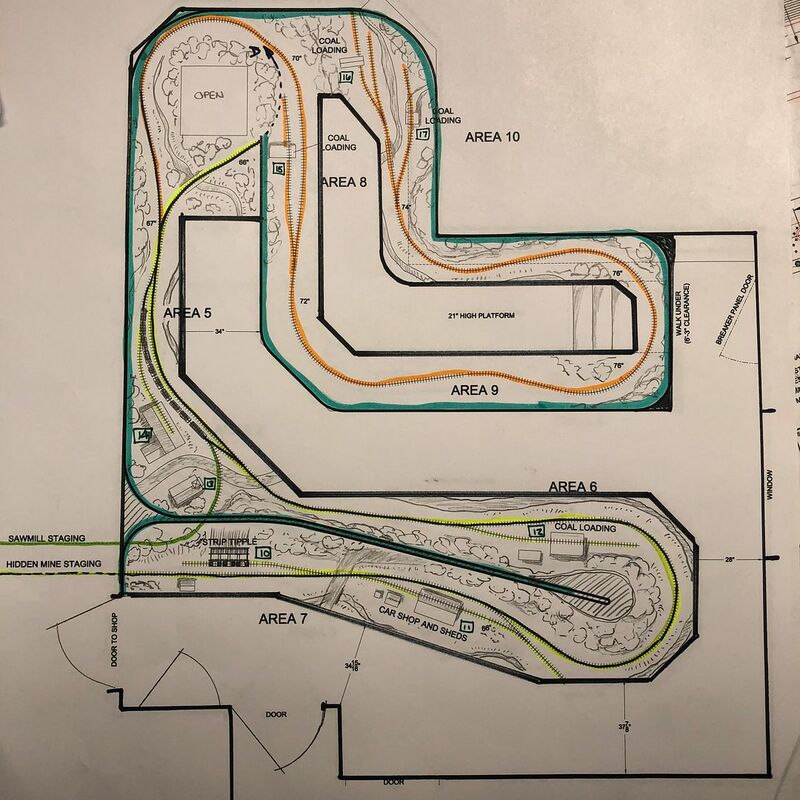 "Area 9" on the plan is yet to be developed. I would like one more rail activity here that would not be coal related but I am not sure I can do it because there is a grade to get up over the stairs to the mushroom. I may just leave that area until I get to building it and see what happens....if I build this plan. Another area that needs some explaining is the end of the curve on the lower level. 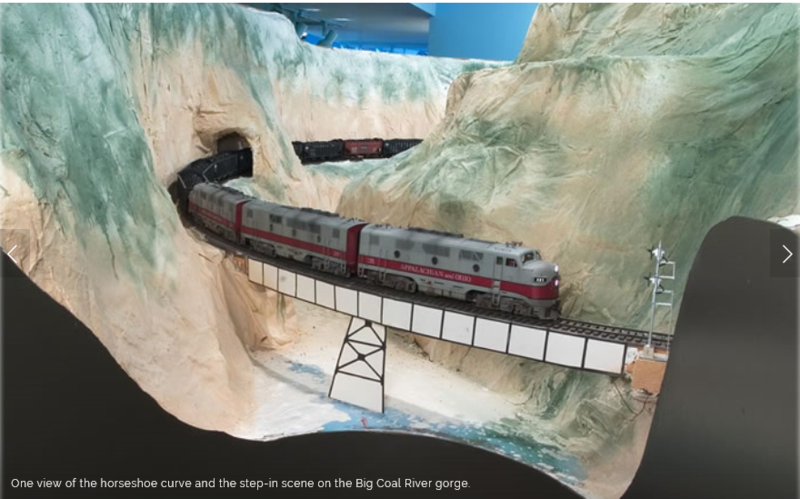 I want to try and build this area like an area on David Stewart's O scale layout, where the scenery is high on the outside of the curve, causing the operator to have to "look through the canyon"
Will develop into a great scene! I like this plan SO much better than the previous one. I didn't want to seem negative at the time, but when I saw the first iteration I felt like you were biting off a lot to chew on. That's fine if it is what you want and are willing to put in the time, or have a crew to help. This plan, for the reasons you have mentioned, seems more plausible and stands a better chance of getting built. When I saw it I immediately thought of David Stewart's A&O and sure 'nuff, your next post confirmed its influence. I think his railroad is already a trend-setter and will be revered by the next generation of modelers as one of the greats. 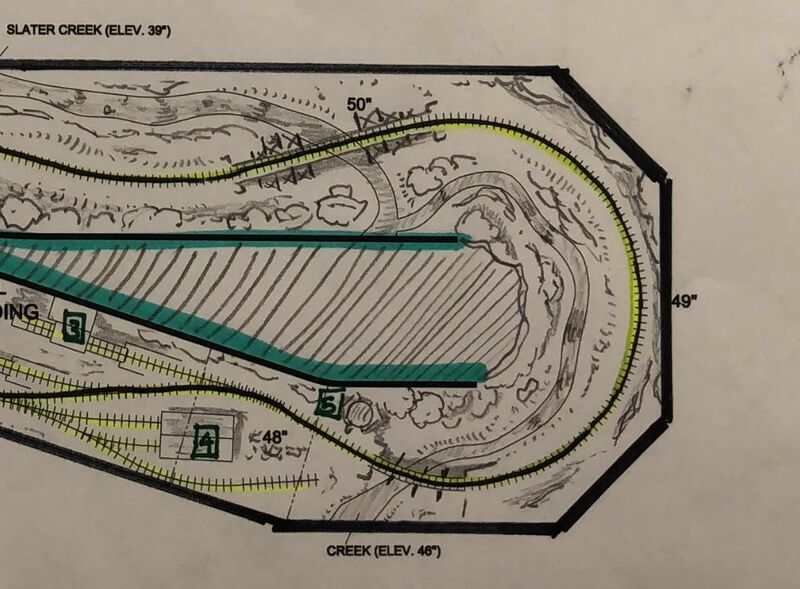 Only suggestion I'd make is scenic - the area marked "open" over the helix is an opportunity for a hidden mountain meadow or some beautiful scenery other than the deep woods. Maybe a beaver pond? 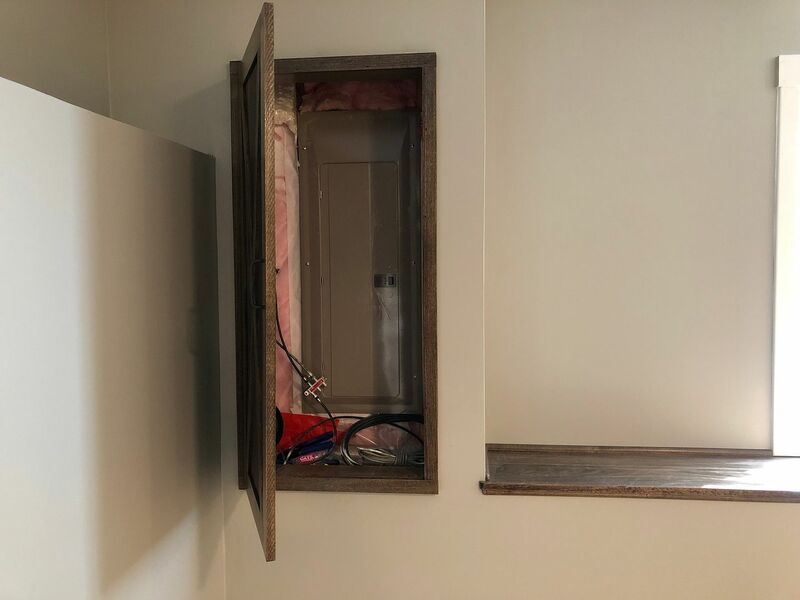 I see the electrical breaker box on your plan, and the place on the wall to install it, but there are no breakers yet. I imagine all the outlets in the basement will be on new circuits. Given any thought to lighting? The hole in the wall is for a door that I am having a cabinet shop make. if you look close you can see the breaker box is set inside the opening. 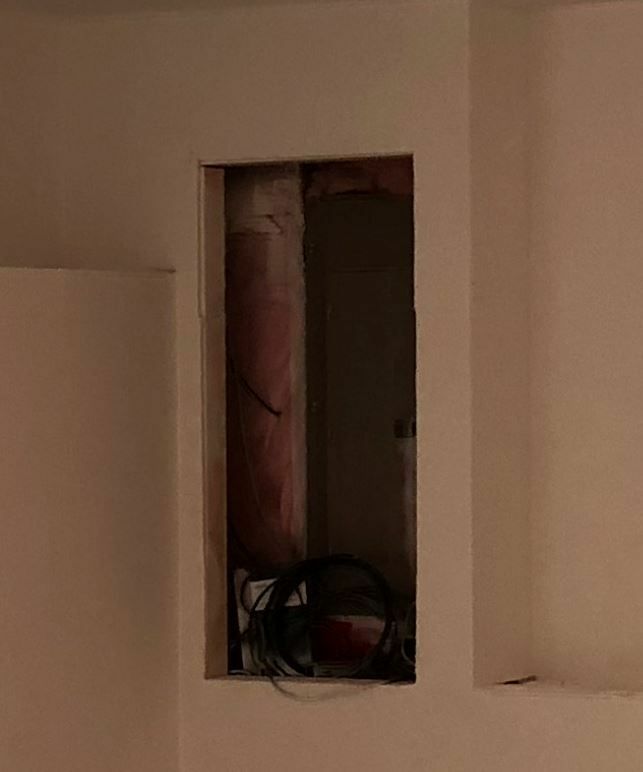 the reason I did this is because I wanted space in the "breaker closet" to have an electrical outlet and some shelves for routers, and internet switches. I also have a bunch of conduit that I ran from all the rooms in the house and the garage so I can easily pull new wires and add circuits. also all the data cables in the house run here in conduit so I can pull new cables as technology changes. I am not adding much for room lighting. when my son is staying in the room I will have a ceiling fan and some random room lights. when he moves out I will take it all down and install block out plates over most of the boxes, except where I have places some aisle lights. I am going to light the layout with the same LED strips I was using on my previous layout. Your new plan looks well thought out. The mushroom is under appreciated and underutilized. Coal is king on your layout. well, still not photos of trains or models of trains but I am getting closer. 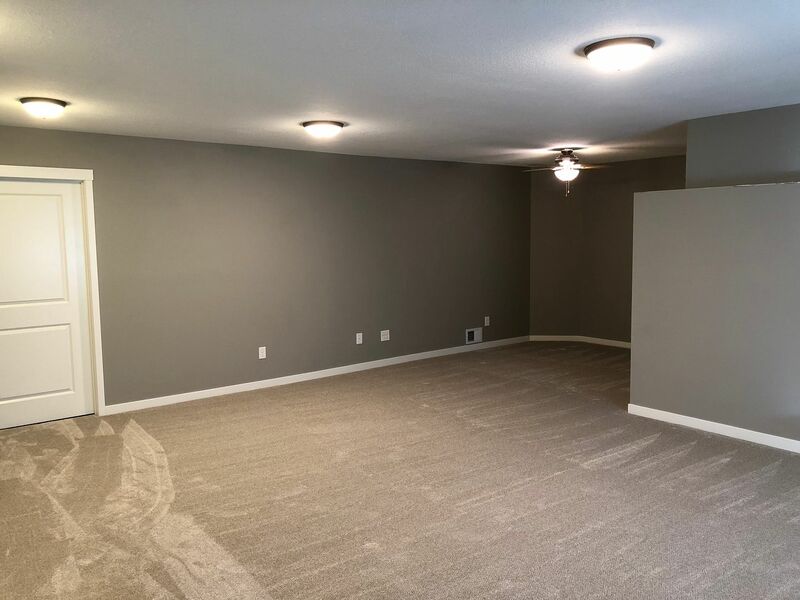 The carpet installers just left and the layout room is pretty much done. The high ledge is not finished because when I build the layout in this room most of it will be covered with the upper deck in the mushroom area, whatever does not get a layout over it will get a finished shelf. 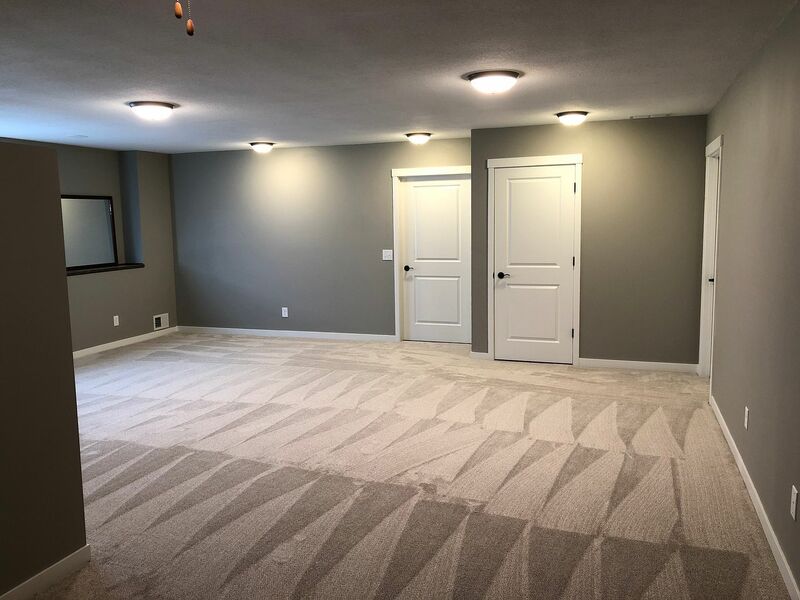 the carpet is pretty thin, more like an office carpet, just enough padding to make it nice on the feet but tight enough that it should be easy to vacuum. the funny thing is that most of what you see will be covered by the layout when it gets built, oh well. 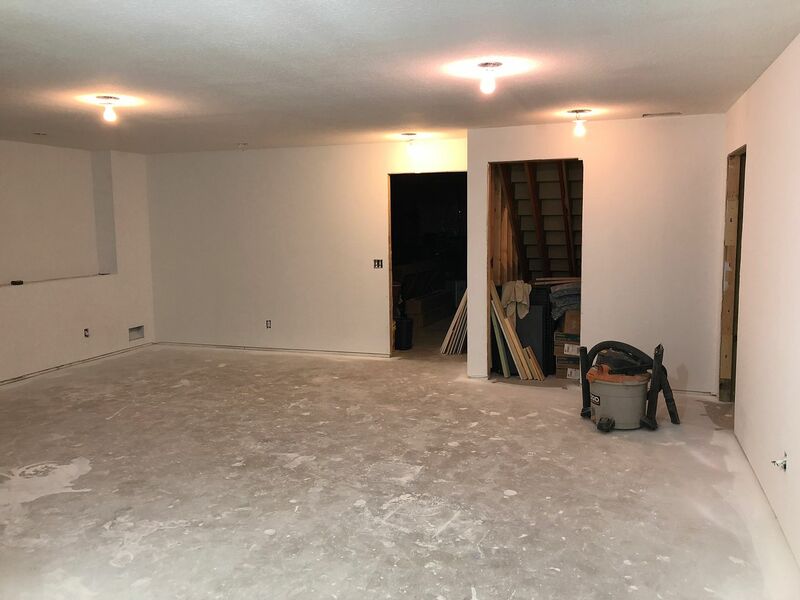 the good news about getting this room done is now I can move all the stuff that is being stored in my future work shop out of it and I can start setting that space up and get building things, then I will at least have pictures of train models to post. here is how the breaker box door turned out, I made it out of some Poplar that I had and stained it to match the upstairs cabinets. 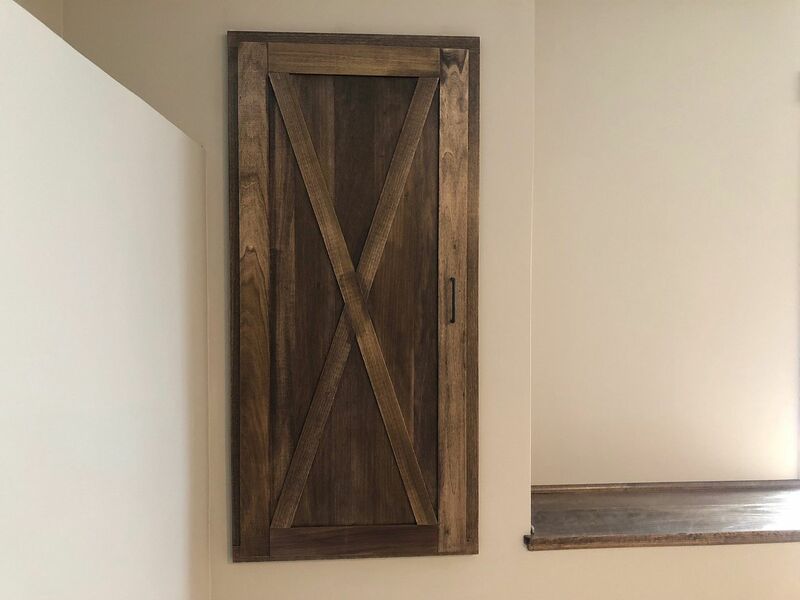 we have a "barn door" in the upstairs so I made this "mini barn door" to match it. inside of this box will be all of my internet devices and router. I have conduits from different parts of the house terminating here so I can pull new cables when technology changes and I need to upgrade. I can also add outlets in the future easier.